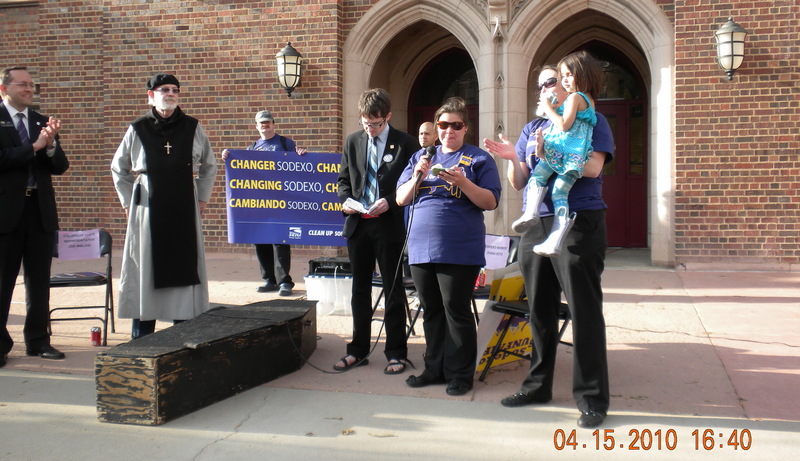 (Note: Yesterday – April 15, 2010 – I attended an event organized by University of Denver students in support of university employees of SODEXO, the multi-national corporation that has the concessions contract at the university. 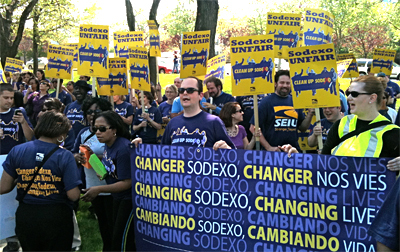 As a part of a national effort, DU’s SODEXO workers have been trying to unionize. The company refuses to even meet with the union despite numerous attempts to do so on the part of the Service Employees International Union – SEIU. 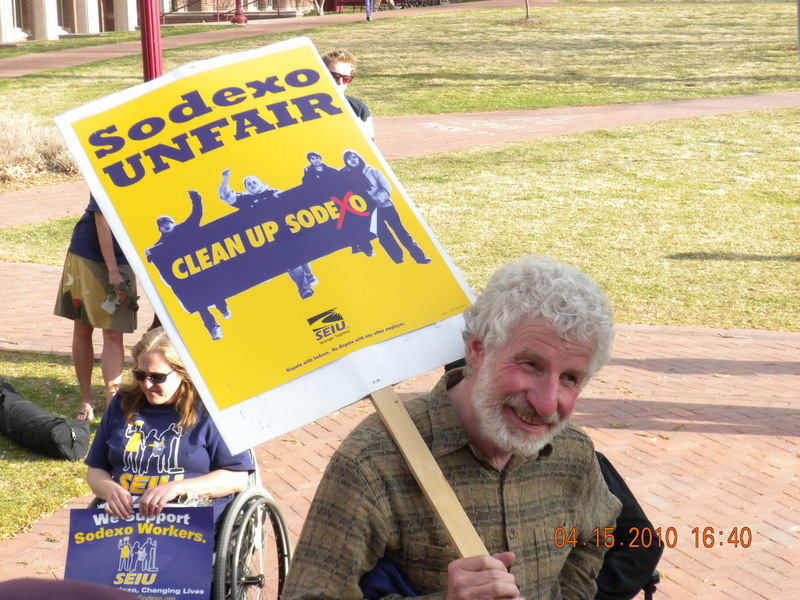 The University claims to be `neutral’ in the controversy between SODEXO and the SEIU, which essentially means that they will not lift a finger to help SODEXO employees unionize and get improved salaries and working conditions. Faced with this impass, SEIU, in conjunction with some student groups led a rally on campus yesterday in support of the SODEXO workers. The rally essentially protested the low wages and punishing working conditions of the SODEXO workers and called upon the university to use its influence to `encourage’ SODEXO to negotiate with the union, which it refuses to do to date. Several state legislators, a city councilman and a minister joined student and union organizers in this protest rally. University of Denver faculty participation was … rather thin. there were three of us, all from the Korbel School of International Studies. 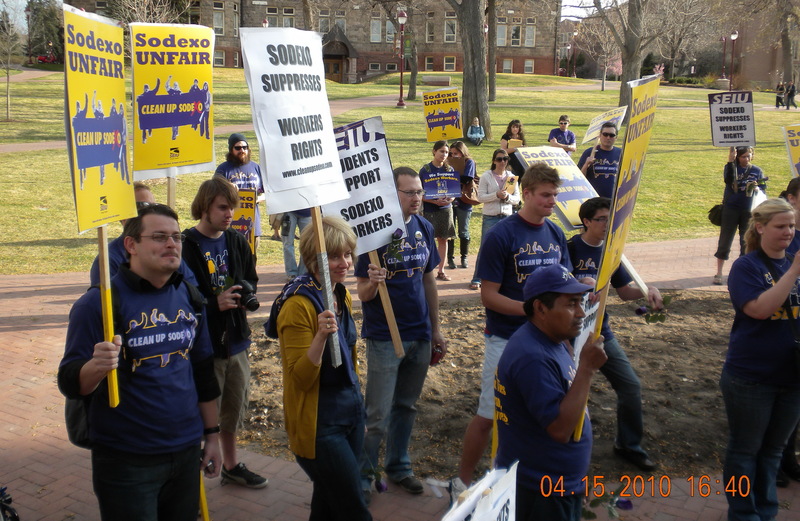 The University of Denver protest was one of many protests nationwide targeting SODEXO. Photo at right is from Washington DC. ing more than a billion dollars profit in 2009. A brave new world is before us even in the cafeterias of the University of Denver. “Most of the time, my coworkers and I are in charge of the kitchen. If the workers are sick, they are told to come in (good to know that the University worries about swine flu and ordinary colds getting around), threatened with firing if they don’t. (As another speaker, Daniel Kagan, a state representative, pointed out, this is an issue of trust or respect. Hourly workers at the University are not trusted to deal honorably with disease – are forced to report – whereas faculty and administrators are not. Workers do not receive a living wage, enough to support their families (paid as low as $7.50 an hour, often qualifying for public assistance). They are not paid enough to afford health insurance offered by Sodexo (2/3 of non-managerial employees are not covered; the University also does not contribute to their health care coverage). Diane also said “most of the workers are really hard workers, yet they don’t get respect or fair treatment. We like our jobs; we love to serve the students. We relate to them, we like to hear their stories. I also really love to cook…Sodexo’s fear and intimidation tactics should stop! I like my job,,.but me and my coworkers are tired of being the backbone of this company and not getting recognized for it.” Like Walmart, Sodexo’s style of capitalism is inconsistent not only with a middle class life, but with democracy and decency. Brother David Garner, one of the Grey Robed Monks of St. Benedict, a graduate of Iliff school of Theology which is on the DU campus, read the mission statements of the University and several schools, including my own. Words such as an academic organization serving a public good featured in each. Does overworking, underpaying and not permitting cooks breaks or sick-leave figure in such a good? He lead the interment of justice for workers at the University, speaking over the coffin, with the hope of “resurrection.” 150 workers, students, and faculty members showed up (I was delighted to meet Ilene Grabel and Rob Prince from my own department and Haider Khan and George Demartino, who could not come, sent me fliers; perhaps 15 students came also), marched and chanted. Chris Nevitt, a city councilman, speculated that the Chancellor might not know (I strongly suspect he is right about that) and that even the higher ups at Sodexo might not know (less likely since you don’t make a billion dollars by enforcing misery without attending to quite specific harassment – or general policies about what each place should clear that requires such harassment – of workers, though the fact that supervisors don’t pitch in in difficult circumstances is probably something local). Dixon Doyle, an undergraduate, spoke eloquently, “I’m sad to see my school administration allow this to happen on our campus. Sodexo workers have become my family, and I am here to stand with all of them.” Nevitt, as well as Joe Miklosi and Daniel Kagen, state representatives, also spoke. I found it heartening that the union had gathered such support and that some Democrats actually walk picket lines (this was not true in ordinary or militant union activities during the Cold War). Miklosi spoke forcefully about how his mother had been a cook (apparently a single mom) in Michigan. She had been determined to put Joe and his brother through college. He was paying a spiritual debt by speaking at this rally and added an historical dimension to its spirit. Despite tutoring by a graduate student in the math department, Joe didn’t pass a math test the next year (I thought this a form of torture myself and found nearly every aspect of the University’s conduct embarrassing). He left the University. I was involved in several more cases defending workers who had been fired, but in the next few years, the University laid off 2/3 of its custodians and smashed the union. But the University has contracted with Sodexo; there is something frightening and sad about a multinational corporation providing food services (probably accompanying a significant rise in provision of fast food or chemicals flavored to provide food-like substances without nutrition to University students in the US and abroad). That people like Diane Soto put their hearts into cooking would make Sodexo decent and well thought of; that it treats Diane with such miserable contempt about breaks and sick leave and pay reveals its deficiency. But surely the University can do something about this. I have written about Marx’s activities in organizing international strike support in the International Workingmen’s Association (1864-72). This involved Europe-wide strikes for instance, strike support on the Continent to prevent scabs from being hastily imported into England; or strike support from England for Belgian mine workers and the like. It also involved organizing large demonstrations in London, one of a 100, 000, English and Irish immigrant workers, in solidarity with independence for Ireland (think of the dire conflicts that might have been avoided…). I published “Marx on Internationalism and War,” about these matters in Philosophy and Public Affairs, 1978 reprinted in Marshall Cohen and Thomas Scanlon, eds, Marx, Justice and History, and in my Must Global Politics Constrain Democracy? ch. 3). But with Cold War anti-communism, unions did not participate in international organizing, or, except from below, in anti-Vietnam war and other protests. forces in Afghanistan here or of psychologists from below to the role of the American Psychological Association in licensing “professional” participation in torture – crosses the boundary of eccentricity or self-deception into genuine harm. Still universities often permit people to and sometimes even celebrate them for going their own way. This is a public good. It would be a fine thing if through international unionizing of Sodexo, SEIU could achieve breaks and sick days for people like Diane Soto. That, too, would be a sign of democracy, a public good.